How many bites will it take? A Nation of snake Handlers. This weekend, after 20 years of handling snakes, Jamie Coots received his final bite. A rattler got him in the back of the hand. It happened as Coots, a Pentecostal minister, was leading the Saturday night service at his church in Kentucky. Two hours later, he was dead. The same thing happened two years earlier in West Virginia. 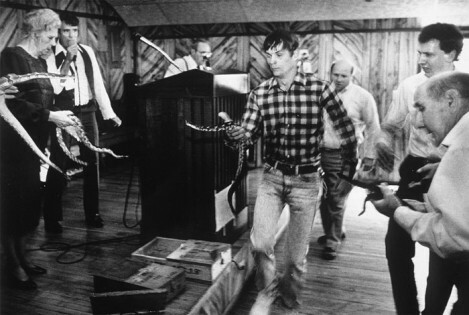 Mack Wolford, another serpent-handling preacher, succumbed to a rattler’s venom. Actually Saletan is not talking about snake handling. While the story of the preachers are true, Saletan found stories of accidently gun deaths and replaced the words gun to snake, gunshot to snakebite, discharged to bit. The reason I am sharing a quote from his Slate piece is because seriously, I don’t get it. More people die each year from gun related accidents and intentional acts than did those killed during the 9/11 attacks, yet we don’t hear politicians decrying the gun culture. None of them are demanding the stopping of the building of gun stores, yet many spoke out against the building of a mosque in New York. We now regulate what you can take on a plane (no liquid or lighters for you!) yet we refuse to regulate how many guns and ammunition you can have in your home and in some states, on your person. We have regulations in place that have cut down the number of automobile and motorcycle related deaths. I know regulation is not the only solution. Our attitude towards guns and how and why we handle them must change. So why hasn’t it? What kind of mentality chooses to continue to ignore all warning signs that a culture of guns perpetuates a culture of violence and senseless accidents? I truly did not understand this mentality until I read this piece. I get it now. The US is a nation of snake handlers. We think it is our god given right to posse guns and ammo, and much like God’s will, we think they will keep us safe from harm. All the while the rest of the developed nations look at us in horror and wonder when the next snake will bite. Author sarijPosted on February 19, 2014 February 19, 2014 Categories Current Events, OpineTags Gun rights, Politics, Religion2 Comments on How many bites will it take? 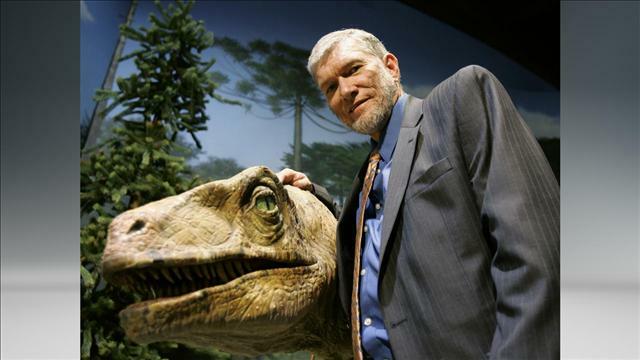 You might not know about this, but two nights ago Bill Nye the Science Guy debated Ken Ham, the found a creator of the Dinosaur museum. The issue at hand was supposed to be creation vs evolution. The debate was a CNN live stream. I watched, not to laugh at Ham but to see if he had anything substantial to say. 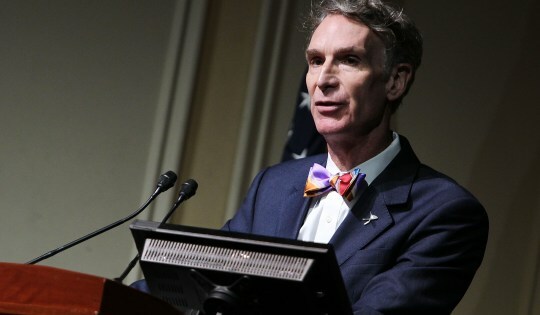 I also watched to support Nye because his involvement in this debate was looked down upon by many in the scientific community. They did not think this issue was worthy of debate. What these high minded skeptics forgot, is that sometimes it is better to lift the veil on crazy.Part of Ham’s crazy was his idea that all the animals were vegetarians before the flood and only became carnivores after the flood. This explains why the animals did not eat each other on the Ark. It also explains how they did not starve after leaving the ark. So, in a twist of irony, God saves the animals only to have some eaten after they get off the boat! For those who did not become carnivores after they left the ark, we are left to wonder what they ate since all the vegetation was dead. That Nye was willing to put himself out there and politely talk to a fanatic should be applauded. The more views like Ham are out there for public consumption the better we can openly and honestly talk about just what it is as a society we believe in. If you don’t know just what it is creationists want our children to learn in school how can you either fight against it or be for it? If CNN had the guts to broadcast the debate live, the world would have seen just how dangerous American religious fanatics can be. Now before you sigh and think I am putting religion down, I am not. I don’t have a problem with the millions of people who need, desire and live by spiritual principals. People who use religion to enrich their lives and the lives of others. No, what I am talking bout are those who use their holy books to wage war on others. Those who insist the only truth is what they feel can only be found it old texts. Texts that support slavery, genocide, hate and fear mongering. Fanatics who seem to forget their holy works also talk about loving thy neighbor and remind us not to judge least we be judged. This is the type of thought that drives wars and is is used as an excuse to discriminate those who are not like them. This is what Ham offered the other night. Instead of debating the issue of creation vs. evolution, Ham used his time to “teach” lessons from the bible. Lesson that centered on the political rather than the spiritual. Both organizations (Ham’s Answers in Genesis and the Discovery Institute) are intimately intertwined with right-wing political causes. In the debate, Ham mentioned these ideas, noting that the biblical definition of marriage is between one man and one woman. The goal is not to defend the absurd idea of young-earth creationism, but rather biblical literalism, the ideology from which fundamentalists draw their strength. If evolution is true, if the Bible cannot be interpreted literally, then women can preach and seek abortion and gays can wed. Throughout its history, religious fundamentalism has been a force to mobilize and defend far-right causes — creationism is merely a “wedge” to expose children to fundamentalist beliefs.